MCALESTER, Oklahoma (April 26, 2017) — Lipska Farm, a 1,000-acre property with irrigated farmland, grain storage, timber, a home, a lake and excellent hunting, will be offered at auction May 24, with Schrader Real Estate and Auction Company marketing the property and conducting the auction. The land will be offered in 10 tracts, ranging from 20 to 449 acres. 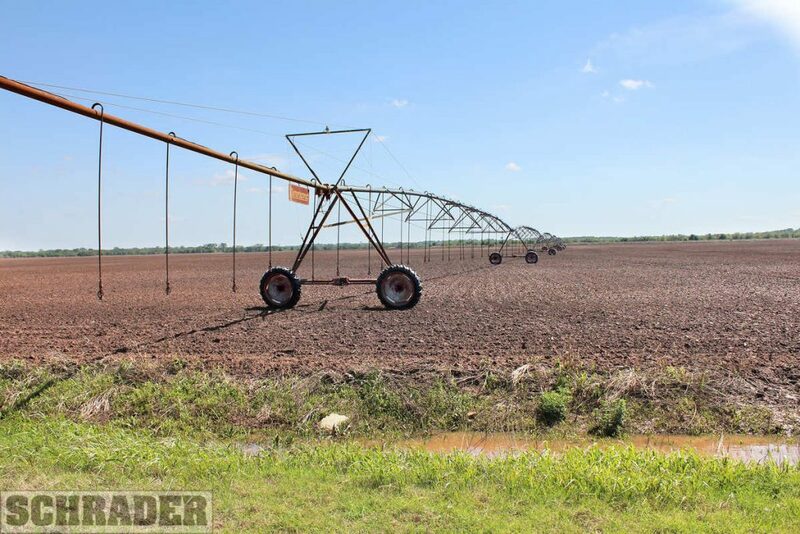 “It’s rare to see irrigated land in this part of Oklahoma, just 20 minutes from McAlester. The majority of the tillable land is located on a single tract of 449 acres, most of which is irrigated with a 20-tower irrigation pivot using water from a lake on an adjoining tract,” said President R.D. Schrader. “This land is equally suitable for hay production and grazing, and a buyer could have one of the few irrigated pastures in the area,” he said. A 20-acre tract that has served as headquarters of the farm has a 3,152-square-foot home, 96,000 acres of grain storage, a shop building and other structures. Schrader personnel will be available at the farm from 3 to 6 p.m. on May 15. The auction will begin at 6 p.m. Wednesday, May 24, at the Elks Lodge, McAlester. Online bidding will be available by prior arrangement.